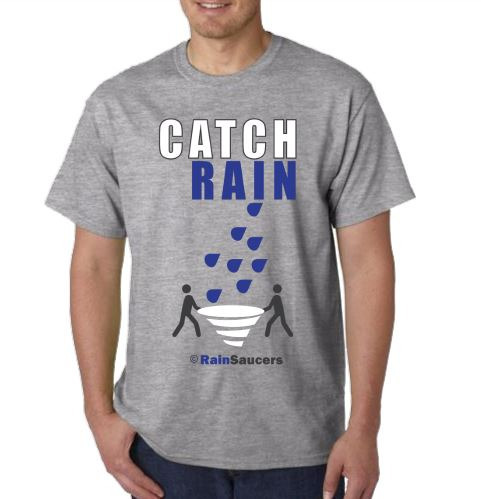 RainSaucer - Catch Rain T-Shirts are here! Catch Rain T-Shirts are here! As most veterans of the Rainwater Harvesting industry will tell you, it's not easy spreading the word. We have a lobby organization called ARCSA that does what they can but in the end, it comes down to general awareness and education. Even in California, where the Drought is in the news almost daily, there is sparse mention of rain barrels. The focus here is on water conservation and recycling water rather catching rain. In other States, awareness of rainwater harvesting is better but still somewhat limited to early adopters. In this age of the Internet and memes and hashtags we think its important to make things into a Cause. So that's why we had these T-shirts made. Our hope is that both our customers and non-customers will spread the word that we should all "Catch Rain". The t-shirts are now available in our Store for $19.95 with FREE shipping. To that end, we are also creating the hashtag #catchrain where anyone interested in our Cause can post related content. Buyers of the t-shirt are welcome to post their selfies there in addition to any rain catching related content or news.